This rugged and durable tactical phone case is ideal for on-the-job and personal use. Its high-performance nylon and high-impact locking clip protect your sensitive electronics even when you’re running and gunning, but it’s still easy to open with one hand. The best news is that it fits most phones, including those already sheathed in a protective case. MSRP $16.99. All-weather waterproof breathable comfort and a professional appearance rolled into one perfect bike patrol jacket. Beginning with a 96% polyester and 4% stretch spandex waterproof/breathable shell with a seam-sealed construction, the Bike Patrol Jacket features flexible and breathable 3M Scotchlite reflective tape for visibility. Other highlights include dual-entry hand pockets, YKK AquaGuard underarm zippers for ventilation, elasticized waist in the rear for fit and professional appearance, and badge tab and epaulette kit included. 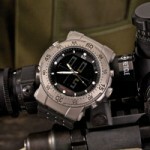 For more info, go to 511tactical.com. The ThumbDrive Thigh Rig attachment is designed to allow you to easily attach your ThumbDrive holster onto a flexible leg platform. Two adjustable ballistic nylon leg tension straps with rubberized threads keep the rig from sliding or shifting from the weight of a holstered firearm. Each strap comes with a quick-detach buckle. Mounting holes allow the wearer to configure an array of accessories. The height-adjustable drop-leg strap comes with a durable swivel clip that permits the reinforced strap to bend at the waist without bulging. Available in black only. MSRP $42.99. New for 2014, the Zero-G Plates System is a revolutionary load-bearing technology to make your duty gear feel lighter, more comfortable and more secure. Realizing that officers often experience back pain from toting their gear, 5.11 Tactical designed these ergonomic plates to be worn on the hips under a duty belt to help distribute weight more evenly and reduce pressure on abdominal muscles, promoting better posture. They are constructed of an aerospace-grade carbon fiber, shaped to be comfortable even when seated, with reusable and durable straps and increased wear resistance. The system also stabilizes holsters during a draw and minimizes the need for extra keepers. The low-profile design works with all duty gear and is almost entirely hidden under the equipment on a belt. MSRP: Not available at press time. What’s good for the guys isn’t always good for the gals. When carrying a concealed weapon, you want a tailored fit so that you can seamlessly retrieve a gun if necessary. 5.11 Tactical’s Sleeveless Holster Shirt for Women is designed for a woman’s form, including wide shoulder straps and an even distribution of weight across the shoulders. An outer mesh level blocks any printing that could reveal what’s hiding in its chest pocket. MSRP $74.99. The 5.11 name is known for its high-quality tactical apparel and equipment. The Rapid Assault Shirt’s specially blended fabric of cotton, polyester and spandex acts as a second skin to help wick away perspiration, while the mesh panels provide breathability to the wearer, and both help keep your overall body temperature at a comfortable level. The Rapid Assault Shirt is a perfect addition to your tactical wardrobe with its form-fitting, comfortable and soft material. Crime never stops, and neither will you thanks to the commitment to quality that you have come to expect from the 5.11 name. The Rapid Assault Shirt is available in black, khaki, olive and navy. MSRP $60.99. Ladies have every bit the need for quality tactical gear destined to fit their proportions. The 5.11 Tactical Women’s Taclite Pro Long Sleeve Shirt is constructed from lightweight, breathable and fast-drying 4.4-ounce poly/ cotton ripstop fabric. Significant features include a hidden button-down collar, hidden document pockets, adjustable cuffs and sleeve-keepers. Rounding out the package is 5.11’s Teflon treating for soil and stain resistance. MSRP $55. 5.11 Tactical has partnered with Multiple-Assault Counter Terrorism Action Capability instructors to develop the new All Hazards Prime Back Pack and Ammo Mule. The pack features an internal laptop case and tablet sleeve, a hydration (or armor) compartment, a front admin panel and a large “shove-it” area. The main internal compartment accepts two fully loaded 5.11 All Hazards Ammo Mules for a total of 20 AR magazines. A fleece-lined, padded pocket provides protection for eyewear. The main compartment is lined in high-visibility orange and features MOLLE platforms and removable mesh bags. 5.11 Tactical has teamed up with Wiley X to offer cutting-edge eye protection. For 20 years, Wiley X has provided critical eye protection to the FBI, DEA, Army Rangers, Navy SEALS and other elite units. Designed, manufactured and tested by Wiley X for optimal precision, durability and safety, 5.11 Tactical’s state-of-the-art Ascend Sunglasses feature die-cut selenite polycarbonate lenses that prevent angular distortion and offer 10 times the impact resistance of glass or resin. The T-Shell lens coating provides scratch, crack and craze (stress mark) resistance. Frames are built with virtually indestructible Grilamid TR-90 homopolyamide nylon for extremely high bend strength, low density and high resistance to chemical and UV damage. Oil- and sweat-resistant rubber contact points at the nose and temples make these sunglasses extra comfortable for work, training, recreation and travel. Also available are the Shear and Climb models, which, like the Ascend, exceed both ANSI Z87.1-2003 and EN 166 safety and optical standards. MSRP $84.99. Crime never stops, even in inclement weather. Now you can be prepared when the skies open up. The high-performance 5.11 Patrol Rain Pants are user-friendly and designed to easily slide over your uniform. The unique, worry-free Prym® snap and elastic waistband enable you to secure the rain pants directly below your duty belt and access it without obstruction. These pants are extremely functional thanks to the pass-through pockets which allow you to reach your interior pockets. Made from ultra-high-performance, breathable, waterproof material, the pants offer built-in, abrasion-resistant kick panels with 12-inch side zippers. Using 100% bonded soft shell materials that are completely waterproof, fully seam-sealed and breathable, the Softshell Patrol Duty Jacket offers both the uniform appearance administrators require and the comfort and feel of soft shell materials that wear like a second skin. Included in the jacket are 5.11 Tactical backup belt system-compatible pockets and a badge tab kit. The jacket has adjustable sleeve closures, as well as two interior storage pockets and radio mic or headphone pass-through openings in each of the large hand-warmer pockets, allowing the radio ear wire inside to stay unseen and dry. Additionally, the Softshell Patrol Duty Jacket features a removable, waterproof hood and standard epaulettes sewn onto each shoulder. Available in black and dark navy. MSRP $199. 5.11 Tactical’s Sabre 2.0 Jacket is a technologically advanced concealed-carry jacket with its QUIXIP side-access system for fast sidearm access. Radio mic pass-through openings from the hand-warmer pockets to the inside of the jacket and three pullout ID panels mean you can remain covert until you choose not to be. 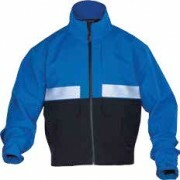 The outer shell features increased waterproofing and is lined with mesh and taffeta for added breathability. Waterproof zippers on the front and arms allow for additional protected storage. The removable hood can be detached and stowed in an easily accessible back-zipper pocket. The large upper-arm hook and loop allow you to add your departmental or favorite patches. Available in black, coyote, dark navy and moss. MSRP $264.99. Starting with the excellent fit and performance of the Tac AK2 — made with Kevlar fabric — 5.11 Tactical added its ergonomic, articulated hard knuckle plates to create the HardTime tactical gloves. Instead of a single piece covering all four knuckles, the two plates flex with your hand, each covering two knuckles and improving comfort, dexterity and performance while protecting your knuckles from impact. Tough, thermoplastic plates are padded on the hand side and covered with a durable, subdued-finish TPR laminate on the business side. MSRP $74.99.